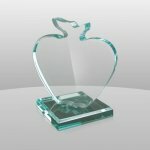 With it's unique apple-shaped design and green acrylic tint, this acrylic apple award is a great award or engraved gift for an educator, the apple of your eye, or item to represent the State of Washington's apple-growing industry. 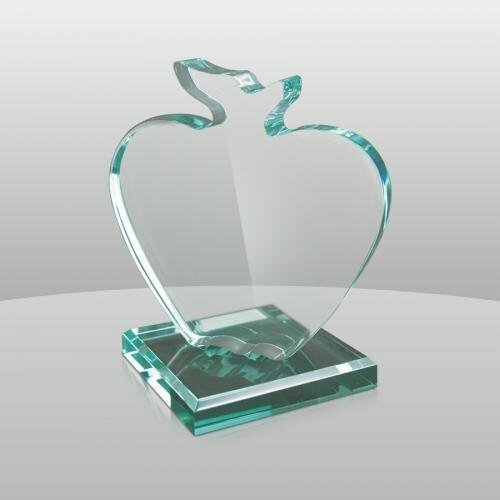 Available in two sizes, this award is mounted to matching green square base. See also Acrylic Apple Award with Clock. We hate to admit it, but one of our least expensive items is also one of most favorite and fun! With your key words, favorite color scheme, and selection of fonts, these 1.25" x 5" aluminum bookmarks become personalized pieces of art. Front imprinted side of bookmark is white, which can remain as the background color, or you can choose a different background. Reverse side is silver and cannot be imprinted. The samples shown here are just to give you ideas; depending on your selections, no two will ever be the same. Price includes full-color imprint. 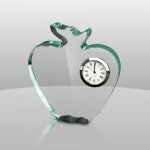 Place in cart to order online; specify text, color scheme, and font style (see next pararagraph); and select in-store pickup or other shipping method. During the checkout process, in the Special Instructions dialog box, specify the words you want included in the bookmark. The fewer the words, the more often they will be repeated within the bookmark. A person's name and favorite activities, a favorite quote or passage from a book, or any other collection of words relevant to the recipient work well. Also note general color scheme and background. For example, bright pinks and greens with white background, or autumn colors with brown background. Finally, specify general style of font: masculine, feminine, quirky, traditional, etc. If you are ordering more than one and you want them to be identical, please note that for us.